PENSACOLA, Fla. — President Donald Trump didn't have to set foot in Alabama Friday night to cast his shadow deep into the state and its hotly contested special Senate election. Just four days before voters go to the polls, at a rally about 15 miles from the Alabama border, Trump delivered his most full-throated endorsement yet of Republican candidate Roy Moore. "We need somebody in that Senate seat who will vote for our Make America Great Again agenda,” Trump said, listing items such as combating crime and illegal immigration, nominating conservative judges to the federal bench, protecting gun-owners’ rights and creating "jobs, jobs, jobs," as priorities. "So get out and vote for Roy Moore." The president echoed those sentiments in a Saturday morning tweet. While he is not expected to appear in public with Moore, who has been accused of sexual misconduct with teenage girls, Trump will physically bracket Alabama before Tuesday’s election. On Saturday, he plans to participate in a ceremony for the opening of a civil rights museum in Jackson, Mississippi, the state immediately to the west of Alabama. In short, it will be almost impossible for Alabama voters to miss Trump — and his support for Moore — this weekend. What they’ll see, hear and read are clips of Trump taking credit for the rising stock market, job growth, the turning back of ISIS, a tax-cut bill that he described as a “Christmas present” to the American people and efforts to spend more on the military. They’ll also be bombarded with Trump’s thoughts on his own adversaries — “MS-13 animals,” the media and congressional Democrats — and Moore’s opponent, Democrat Doug Jones. "We can’t afford to have a liberal Democrat who is completely controlled by [House Minority Leader] Nancy Pelosi and [Senate Minority Leader] Chuck Schumer," Trump said to boos. "His name is Jones and he's their total puppet." By tying Jones to top Democrats in Washington, Trump attempted to remind Republicans of the policy stakes of the election. 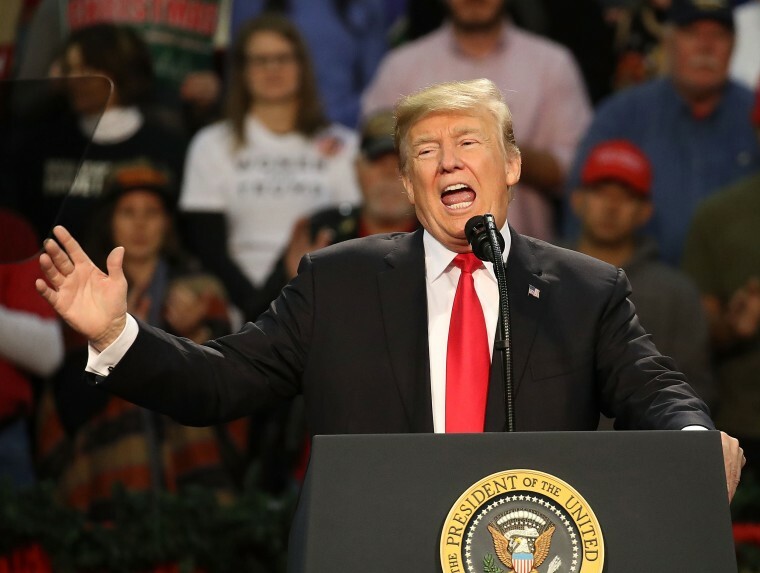 “We cannot afford, the future of this country cannot afford to lose the seat,” Trump said, referring to his party’s razor-thin 52-48 advantage in the Senate. He accused Democrats of trying to “hold troop funding hostage for amnesty” as they try to use a year-end spending deal to protect immigrants who were brought to the U.S. as children from being deported. Playing to the white evangelical Christians who form the most loyal base that Trump and Moore share, the president spoke in stark terms about God, country and a battle between good and evil, casting himself and his supporters in the role of heroes. Americans don't worship government, Trump said, "we worship God." "We believe that every American should stand for the national anthem," he said. And, he added, he’s fighting “bad and evil people” who have made their living in Washington. Responding to chants of "lock her up" from the crowd, the president denounced America's "rigged system." "This is a sick system from the inside," Trump said. "And you know there's no country like our country but we have a lot of sickness in some of our institutions and we're working very hard." Trump’s marriage of those themes was underscored by several large American flags and gigantic signs with green and red typeface featuring a Trump-Pence logo and the words “Merry Christmas." While the nearly 80-minute address had the feel of a campaign stump speech — a testing out of themes and phrases for the 2020 election — it was the punchy and passionate case he made for Moore that held the most importance for his party and his agenda in the short term. He tried to bolster Moore's defense that he did nothing inappropriate by pointing to the acknowledgment by one accuser, Beverly Young Nelson, that she added notes to the bottom of a yearbook message she says was written by Moore when she was in school and he was an adult. Nelson added the date and location below the yearbook message, and "added that to remind herself who Roy Moore was and when and where he signed her yearbook," her attorney, Gloria Allred, said at a news conference Friday. Nelson said at the news conference that the message and signature are Moore's. “I want everybody to know that I stand by my previous statement, that Roy Moore sexually assaulted me," she said Friday. Allred is representing Summer Zervos, the former "Apprentice" contestant who says Trump sexually assaulted her in 2007, in a defamation lawsuit against the president.